Symbolic Definition: Kingdom or Power. Referring to a Government or Power, usually the predominant power of the time or era. Babylon, Medio-Persia, Greece, Rome, and the Papacy during the middle ages. Dictionary Definition: Beast = any nonhuman animal, especially a large, four-footed mammal. 17 These great beasts, which are four, are four kings, which shall arise out of the earth. 18 But the saints of the most High shall take the kingdom, and possess the kingdom for ever, even for ever and ever. 19 Then I would know the truth of the fourth beast, which was diverse from all the others, exceeding dreadful, whose teeth were of iron, and his nails of brass; which devoured, brake in pieces, and stamped the residue with his feet; 20 And of the ten horns that were in his head, and of the other which came up, and before whom three fell; even of that horn that had eyes, and a mouth that spake very great things, whose look was more stout than his fellows. 21 I beheld, and the same horn made war with the saints, and prevailed against them; 22 Until the Ancient of days came, and judgment was given to the saints of the most High; and the time came that the saints possessed the kingdom. 23 Thus he said, The fourth beast shall be the fourth kingdom upon earth, which shall be diverse from all kingdoms, and shall devour the whole earth, and shall tread it down, and break it in pieces. 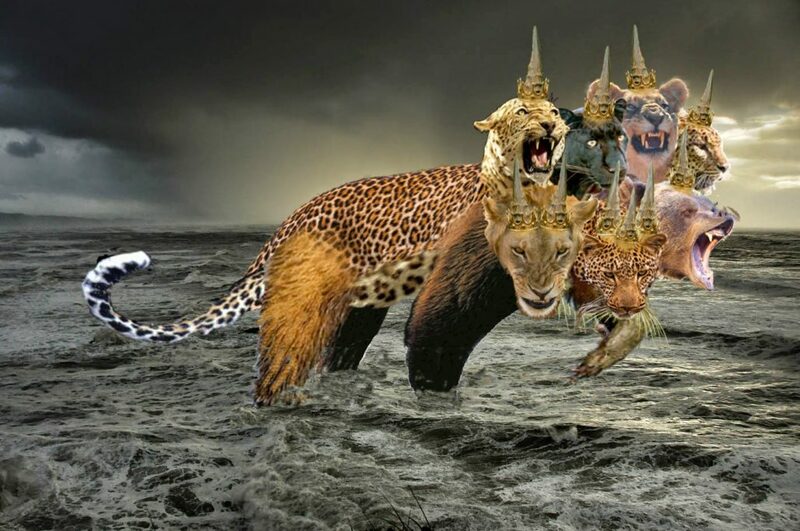 Revelation 13:1-4 1 And I stood upon the sand of the sea, and saw a beast rise up out of the sea, having seven heads and ten horns, and upon his horns ten crowns, and upon his heads the name of blasphemy. 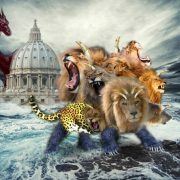 2 And the beast which I saw was like unto a leopard, and his feet were as the feet of a bear, and his mouth as the mouth of a lion: and the dragon gave him his power, and his seat, and great authority. 3 And I saw one of his heads as it were wounded to death; and his deadly wound was healed: and all the world wondered after the beast. 4 And they worshipped the dragon which gave power unto the beast: and they worshipped the beast, saying, Who is like unto the beast? who is able to make war with him?